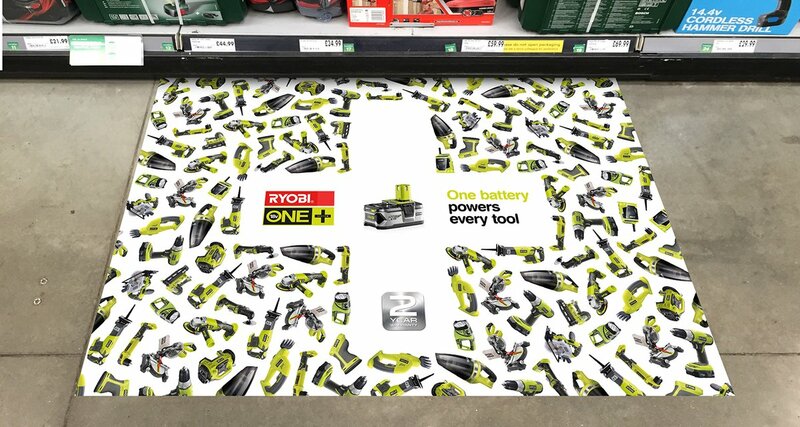 Ryobi Limited is a global manufacturer of components for the automobile, electronics, and telecommunications industries – within the UK, we undertook a POS campaign to sell power tools through hardware stores. To create scalable fresh solutions to communicate ONE+ and its new innovations. The challenge was to communicate the benefits of purchasing a Ryobi ONE+ product, which was that the battery fits all Ryobi ONE+ range. In store, it was identified that the box was rarely on show, so new solutions were required including: POS communications on doors, tills, doors, t-shirts and tags.